The result? 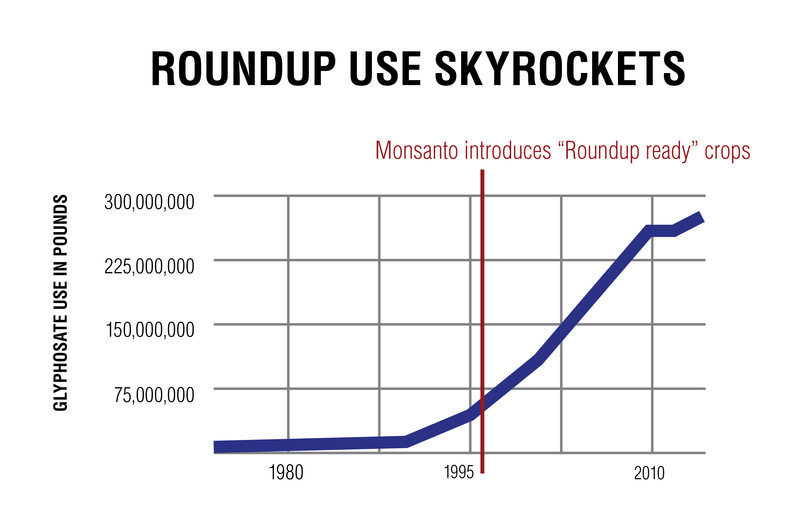 Glyphosate is now the most widely used agricultural chemical in U.S. history. More than 300 million pounds of the chemical are sprayed on U.S. farms every year! And since it was introduced in 1974, 9.4 million tons of glyphosate have been sprayed worldwide. Subway recently confirmed that it will ring in the New Year serving chicken raised without antibiotics. Turkey, pork, and beef will follow. Kudos to the “eat fresh” brand for making this happen and for hitting their first timeline. Small businesses in the U.S. have to shoulder, on average, an extra $5,128 in taxes to make up for the revenue lost due to the abuse of offshore tax havens by multinational corporations, according to a new report by U.S. Public Interest Research Group Education Fund. As a new administration takes office and the possibility of tax reform again enters the national conversation, the report highlights how it’s small domestic businesses and ordinary Americans that have to shoulder the burden of multinational tax avoidance. There’s a rising tide of consumer awareness and concern about antibiotics use in our food supply, and restaurants like McDonald’s and Subway are responding. Even though there’s been considerable progress, there is still a long way to go to eliminate all routine antibiotic use in meat production, and consumers have a vital role to play in changing the status quo. Calling on Congress to protect American consumers from Wall Street's attacks on the Consumer Financial Protection Bureau, the U.S. Public Interest Research Group (U.S. PIRG) launched the “Campaign To Defend the CFPB” today. A new report by the U.S. PIRG Education Fund identifies 11 examples of wasteful highway spending that are slated to cost at least $13 billion and are based on outdated assumptions of ever-increasing driving. The study calls on the federal and state governments to reprioritize scarce transportation dollars to other projects. Friday’s $550 million settlement between the Federal Housing Finance Agency (FHFA) and HSBC North American Holdings Inc. can be treated as a tax write-off by the bank, shifting $192.5 million onto taxpayers. Because the FHFA did not specify that the settlement payment cannot be treated as a regular business expense, HSBC will be able to deduct the entirety of the $550 million payment. We urge (along with the Center for Digital Democracy) the CFPB to issue rules so consumers can use mobile financial services without placing their privacy at risk or exposing themselves to new forms of predatory lending and other unfair practices. We filed a joint comment in response to a CFPB information request. Amending the Constitution was never meant to be easy, but we know that the public overwhelmingly supports getting big money out of politics. Today’s vote is just the beginning, and marks a big step forward in the movement to reclaim our democracy. We comment in a Washington Post story describing Apple's big product announcements Tuesday. We don't talk about the two new iPhones or even the totally new and much ballyhooed Apple Watch. We talk about Apple Pay, a digital wallet. What are its implications for consumer data security, convenience and choice? Excerpt: Yet Apple Pay could prove the bigger bet, given its potential to shake up two industries — retail and finance. [...] “Apple’s claiming it’s more secure. We’ll have to see,” said Ed Mierzwinski, consumer program director at U.S. Public Interest Research Group. Update: The terms of the settlement, which was announced this morning, are at the page http://www.nationalmortgagesettlement.com. We are reading it now. Original: If I am reading the overnight news stories correctly (NY TIMES and Politico and Boston Globe), it appears that negotiators have clarified that the well-publicized settlement between HUD and state AGs and the nation's 5 largest mortgage servicers will not release the big banks from claims related to their activities with the mysterious entity known as MERS that aided and abetted their illegal foreclosures. If so, this is a big deal in ultimately holding the big banks fully accountable. PIRG-backed reforms designed to guarantee that passengers stranded in planes sitting on runways are not treated like cattle have been passed by the House and Senate and are expected to be signed by the president as part of FAA reauthorization (New York Times story). The reforms are largely based on the work of former stranded passenger Kate Hanni and her flyersrights.org campaign for an Airline Passenger Bill of Rights (Kate's statement). The House introduced additional legislation proposing that new revenue for the Transportation Fund would come through increased volumes of oil drilling and that public transit would be kicked out of the transportation fund. This breaks with three decades of public transit being supported by a small portion of the federal gas tax. The House measure would instead funnel all these funds to highways, and leave mass transit to search for new money from Congress at a time when debt reduction rules require massive cuts to the general budget. If you were trying to make America as addicted to oil as possible, you might design legislation like this. In a series of joint privacy petitions to the Federal Trade Commission beginning in 2006 and extended more recently to include behavioral targeting, as well as medical and mobile marketing, U.S. PIRG and the Center for Digital Democracy (sometimes with allies) have argued for greater scrutiny and regulation of the online digital marketing and behavioral targeting ecosystem that involves companies you do business with, social networking tools, third-party advertisers and other players. Today, in the New York Times, Professor Lori Andrews says that "Facebook is Using You." It's hard to keep up, so here are some key consumer news stories I am following that you may have missed this week. We start with CALPIRG Education Fund's new "Cell Phone Guide," look at the Consumer Federation of America's report on auto insurance discrimination and take you all the way to the NYPIRG Straphangers Campaign survey on what's "good, bad and ugly (rats!)" in NYC subway stations.